Recruitment 2017. Candidates eligible for the above vacancies have to send the applications before 11-12-2017. Get the application from the official website http://thanecity.gov.in/marathi/index.php. Download the TMC notification to read the Eligibility criteria and instruction details. Fill the basic details and send the application form through E-mail ID- Recruitment.tmc.2017@gmail.com. Age of the applicant for above vacancies is between 18 years to 36 years. 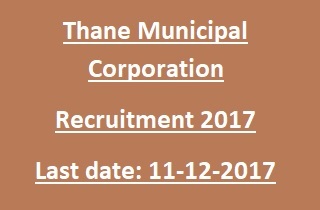 Candidate selection for this Thane Municipal Corporation Recruitment Vacancies is based on written test/ Interview. Please check the below given details regarding Selection Process, Application Procedure, Age Limits, essential qualifications of Municipal Corporation of Thane Recruitment of 16 Junior Engineer, Arakshak, Data Entry Operator Recruitment Notification 2017. Total vacancies available in Thane Municipal Corporation TMC Recruitment are 16 posts. Vacancy details are given below. 1. Junior Engineer: 06 posts. 3. Data Entry Operator: 05 posts. Pay Scale for Jr. Engineer Jobs is Rs. 25,000/- per month. For Data Entry Operator is Rs. 13000/- per month. Jr. Engineer: Engineering degree in any discipline from recognized university. Data Entry Operator: 10+2 passed from any recognized Board/ Institute. See the TMC notification for more qualification details. Upper age limit is 36 years and lower age limit is 18 years. Relaxations applicable as per rules. Candidates will be selected for TMC Jr. Engineer, Data Entry Operator Vacancies based on written test and Interview. See the TMC Notification for selection process details. Interested candidates have to go through the TMC official Notification. Read the Eligibility criteria and general terms & conditions to fill the application form. Get the application from the official website of TMC @ http://thanecity.gov.in/marathi/index.php. Fill the all entries and send the application to the Email ID- Recruitment.tmc.2017@gmail.com. Last date to send application form through Mail is 11th December-2017.